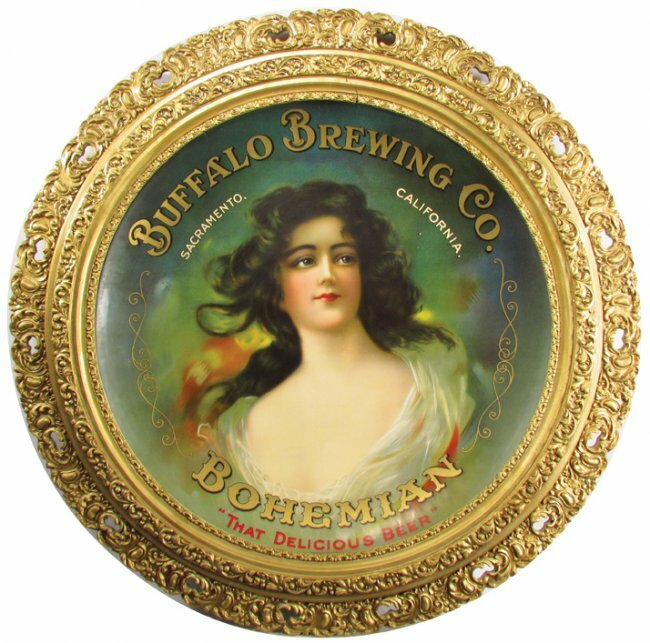 One of my favorite pre-prohibition era advertising pieces is the beautiful Bohemian Beer charger from the Buffalo Brewing Company in Sacramento, CA. This metal charger incorporates an unusual greenish blue two-tone color combination which was not often used in early advertising promotional items. The tray is pretty devoid of an advertising slogan, other than to state “That Delicious Beer”. The wording was surely not meant to detract from the stunning image itself, other than to let the consumer know which beer to order. The Buffalo Brewing Company in the late 1800’s and early 1900’s the largest volume brewer west of the Mississippi River. 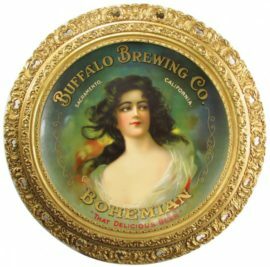 As a result, modern day collectors can find a lot of early advertising items including posters, trays, glasses, bottles, openers, and the like from this brewery. Their largest competitor was 1500 miles away in St. Louis, MO and were the Wm. J. Lemp Brewing Co., Anheuser-Busch, and The American Brewing Company with their flagship ABC brands. All three of those companies were selling beer outside of the U.S. as early as the late 1800’s and were in the top 10 volume breweries in the country. At this time, there was not much between St. Louis and the West Coast as far as larger cities with the exception of Kansas City and Denver, which were both considerably smaller than St. Louis at the time. HONEST SCRAP TOBACCO’S FAMOUS DOG & CAT FIGHT LOGO!A STUNNING BARTLETT SPRING MINERAL WATER SERVING TRAY!